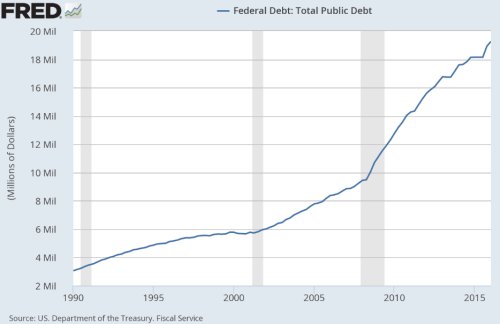 Is US Debt Crippling the Economy? “U.S. debt has been a hotly debated topic for as long as it’s existed—which means it’salways been a hotly debated topic. The thought of knowing that our country has some$19 trillion in total debt outstanding makes many stomachs turn, especially when you consider that it’s more than our total annual GDP (estimated at $18.2 trillion through Q1 2016). The questions on everyone’s minds are: Since when does the United States borrow more than it makes? Is this level of debt sustainable for our economy? Is it debilitating, helpful, or inconsequential? The following charts will help put U.S. total debt in context. Let’s start with the elephant in the room, which is total public debt. There is no question that the total amount of debt outstanding has been growing at an exponential pace since the 1990’s, expanding from some $3 trillion to $19 trillion in 25 years.